Pictograms were established to communicate hazards in the most easy-to-understand way possible. For this reason, pictograms are often the most recognizable element of a label or SDS. A pictogram consists of a red diamond containing a specific image relating to the hazard it is communicating. These images are universal throughout all GHS-compliant labels and SDS’s. There are 9 GHS pictograms in total, but we will only look at those which commonly pertain to cleaning chemicals. Here is a rundown of the GHS pictograms you are likely to see on cleaning chemicals. 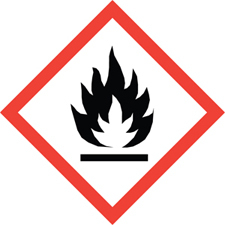 The Flammable pictogram is communicated by a flame. This pictogram communicates that a chemical is flammable, combustible, pyrophoric (ignitable by exposure to air), or self-heating. 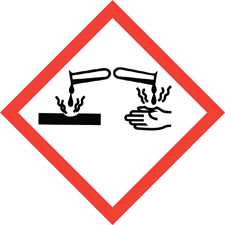 The Corrosive pictogram is communicated by a liquid contacting and corroding a surface and a hand. This pictogram communicates that a chemical is corrosive (not an irritant) to metal, skin, or eyes. 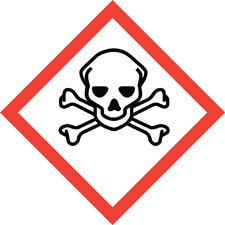 The Toxic pictogram is communicated by a skull and crossbones. This pictogram communicates that a chemical is toxic (poisonous) either by mouth or through the skin. 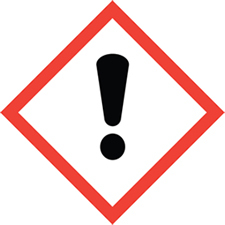 The Toxic pictogram mainly corresponds to the acute toxicity hazard. 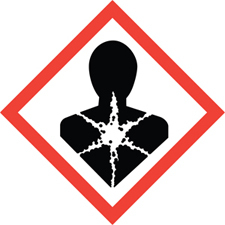 The Health Hazard pictogram is communicated by an “exploding chest.” Health hazards communicated by this pictogram include carcinogenicity, reproductive toxicity, target organ toxicity, and sensitization. The Harmful pictogram is communicated by an exclamation mark. This pictogram is generally considered less dangerous than the others. Hazards associated with this pictogram include skin and eye irritation. Be sure to check out our blog post on GHS Hazards.